After registering three consecutive victories, Delhi Capitals are set to host Mumbai Indians at the Feroz Shah Kotla tomorrow night. The hosts would be brimming with confidence post their string of successful performances in the recent games, while the Blue Army will be determined to avenge their 37-run defeat against Delhi Capitals in the opening fixture. Delhi Capitals have turned out to the dark horses in IPL 2019. With Ricky Ponting and Sourav Ganguly at the helm, the hosts look like a different unit which can beat any given team on their day. Currently, they occupy the second spot in the IPL points table on the back of five victories in their eight outings. Shreyas Iyer is leading his side from the front, scoring the most runs (266) for the Delhi franchise this season. With Shikhar Dhawan, Prithvi Shaw and Rishabh Pant, Delhi possess an explosive batting lineup which can take apart any bowling attack. Mumbai Indians have also managed to get their campaign back on track after a slow start. Having won five games and lost three, the visitors are placed at the third spot in the points table, only trailing behind Delhi on Net Run Rate. Lasith Malinga made a sensational comeback in the previous encounter, producing some brilliant death overs bowling, to help his side register another win. Mumbai have to continue bowling well on the tricky pitch of Kotla if they want to dominate the fixture tomorrow night. The hosts are likely to go ahead with the same starting lineup. Colin Munro will keep his place after a decent performance. Rohit Sharma might bring in Mayank Markende for this contest. Rahul Chahar will have to make way for his fellow leggie. Delhi Capitals: Shreyas Iyer (C), Shikhar Dhawan, Prithvi Shaw, Colin Ingram, Sherfane Rutherford, Hanuma Vihari, Colin Munro, Ishant Sharma, Rahul Tewatia, Jayant Yadav, Bandaru Ayyappa, Sandeep Lamichhane, Avesh Khan, Harshal Patel, Keemo Paul, Axar Patel, Manjot Kalra, Jalaj Saxena, Chris Morris, Kagiso Rabada, Amit Mishra, Nathu Singh, Trent Boult, Ankush Bains, Rishabh Pant. Shikhar Dhawan, Prithvi Shaw, Colin Munro, Shreyas Iyer (C), Rishabh Pant (WK), Chris Morris, Axar Patel, Keemo Paul, Kagiso Rabada, Amit Mishra, Ishant Sharma. 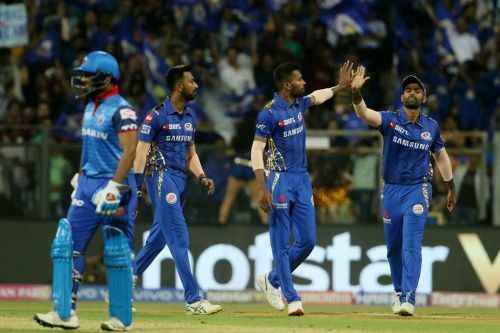 IPL 2019, DC vs MI: Who said what?